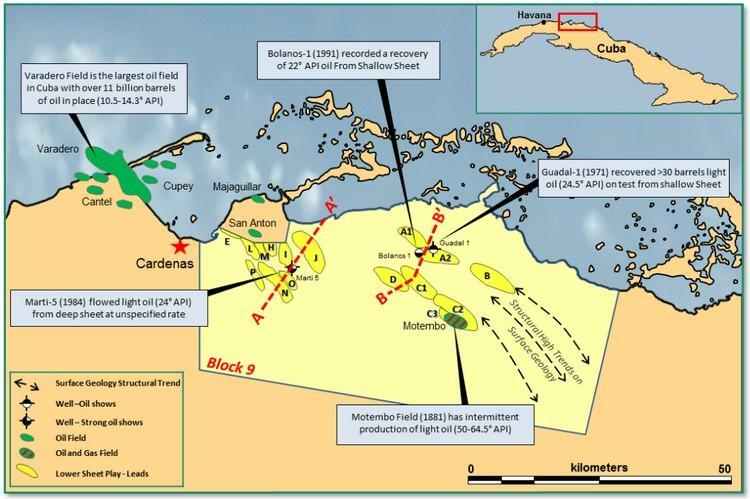 MEO Australia has provided a significant update in relation to its 2,380 km2 onshore Block 9 Production Sharing Contract, located on the north coast of Cuba, 140 km east of Havana and along trend with the multi-billion barrel Varadero oil field. The first of three identified oil plays on Block 9 has been assessed by MEO to contain 8.183 billion barrels of Oil-in-Place with a Prospective (Recoverable) Resource of 395 million barrels (Best Estimate, 100% basis) of potentially high quality light oil. Further work on the other, shallower oil plays, which also have significant oil potential, is continuing and will be reported on as available. 8.183 billion barrels of Oil-in-Place with Prospective Resources of 395 million barrels just in the 'Lower Sheet Play' (unrisked Best Estimate, 100% basis). Conventional 'Lower Sheet Play' with 15 individual leads is one of three identified oil plays in Block 9. Block 9 is a low cost onshore PSC with a number of prior oil discoveries reducing exploration risk. Accelerated drilling program to explore further strong potential of 'Lower Sheet Play' now under investigation. Assessment of the other two oil play types is ongoing and is expected to add significantly to the potential Oil-in-Place and Resource base of Block 9. MEO’s CEO and MD Peter Stickland, commented on the announcement: 'It is extraordinary to be able to already identify nearly 400 million barrels of prospective resources in conventional targets in a proven trend at moderate target depths, located in an accessible onshore area. This result, which is for only one of three identified play-types, speaks to the enormous potential of MEO’s Block 9 PSC. Significantly, these leads have the potential for billions of barrels of oil-in-place however the prospective resources so far assume only the historical 5% recovery factor from offset fields in Cuba. MEO considers that some of these leads can potentially be matured into early drilling opportunities, particularly those with nearby or shallow oil recoveries from old wells. This, along with characterising the potential of the other two play-types, will be a focus of our work in the coming months. The scale of the identified prospectivity of Block 9 PSC suggests it has the potential to have a substantial positive impact on Cuba’s energy sector.